Ketamine is increasingly being used in the acute care setting for its favorable analgesia, sedation and induction properties. Ketamine is unique among the induction sedative/hypnotic agents in both its mechanism of action and its clinical effects. Ketamine, at doses > 1.0 mg/kg produce a state of "dissociative amnesia," referring to a dissociation occurring between the thalamocortical and limbic systems on the electroencephalogram (EEG). Clinically, the result is a catatonic state in which the eyes often remain open, with obvious nystagmus. The patient may sporadically move, but non-purposefully, and not generally in reaction to painful stimuli. Ketamine produces excellent amnesia and is the only induction agent to also provide profound analgesia. Ketamine's dosing continuum effects are different than other sedatives in that the achieved dissociated, non-responsive state is only rarely associated with a loss of protective airway reflexes and respiratory depression. Ketamine has a centrally stimulating effect on the sympathetic nervous system (SNS) by decreasing catecholamine reuptake. These effects are responsible for many of the observed clinical effects. For example, via SNS stimulation, ketamine relaxes bronchial smooth muscle, in turn causing a decrease in airway resistance and improved pulmonary compliance. At higher doses, ketamine may also act directly to relax bronchial smooth muscle, although clinical benefit has not been clearly demonstrated. These effects make ketamine a particularly attractive agent for induction of the patient with acute bronchospasm. Ketamine tends to preserve ventilatory drive, although a large, rapidly administered bolus dose may still result in apnea. Ketamine may with some delay result in an increase in secretions, an effect that can be managed (although rarely indicated) with a drying agent such as glycopyrrolate or atropine. However, pretreatment with atropine has been associated with a higher risk of adverse events in the pediatric population. This tends to be more of an issue in children, and in adults when doses exceed 100 mg. In addition, ketamine when used alone (i.e., not part of an RSI) has been associated with laryngospasm. Ketamine associated laryngospasm is relatively rare (0.3%), and more likely to occur in young children, those exposed to prolonged upper airway manipulation (i.e. dental procedures, endoscopy), and those with an active upper respiratory infection. Despite being very uncommon, some consider ketamine sedation to be contraindicated under 3 months of age. The incidence in the adult population is less well documented but in general reports of laryngospasm are even more uncommon. SNS stimulation is also responsible for an increase in heart rate (by about 20%) and blood pressure (a rise of around 25 mm Hg) with ketamine use. Care should thus be exercised in patients with known significant coronary artery disease, as ketamine has the potential to aggravate myocardial ischemia. Due to its ability to raise blood pressure, it has been suggested that ketamine is the drug of choice in patients with unstable hemodynamics. However, the hemodynamic effects are secondary to SNS stimulation and intrinsically, ketamine is in fact a myocardial depressant. Thus, ketamine can potentially lower blood pressure in at risk patients (hypovolemic or high shock index > 0.8) who are already maximally sympathetically stimulated.. Therefore as with all induction sedative/hypnotics, caution should be used in patients with hemodynamic compromise, and the induction dosage should be reduced. Much controversy has centered in the past on the use of ketamine in patients with intracranial pathology. Historically, ketamine has been considered contraindicated in patients with decreased intracranial compliance due to reports that it could increase ICP and increase cerebral oxygen demand. However, the data upon which these recommendations were made did not involve patients with traumatic brain injury. Indeed, more recent data using human and animal subjects suggest that low-dose bolus ketamine may have a beneficial effect on CPP in this setting. In some studies, ketamine administered with or without a GABA agonist (such as propofol or midazolam), has been shown to lower ICP. A cerebral protective effect has been shown with ketamine use in animals, possibly mediated through NMDA receptor blockade, and some early clinical trials suggest a neuroprotective effect of ketamine in the adult population. A number of systematic reviews have been published showing no evidence of increased ICP, increased mortality or worsened neurological outcome when ketamine has been used as an induction agent or sedative in critically ill patients with or without traumatic brain injury41. In the American College of Emergency Physicians (ACEP) Guidelines on the use of ketamine, traumatic brain injury has been removed as a relative contraindication to its use. 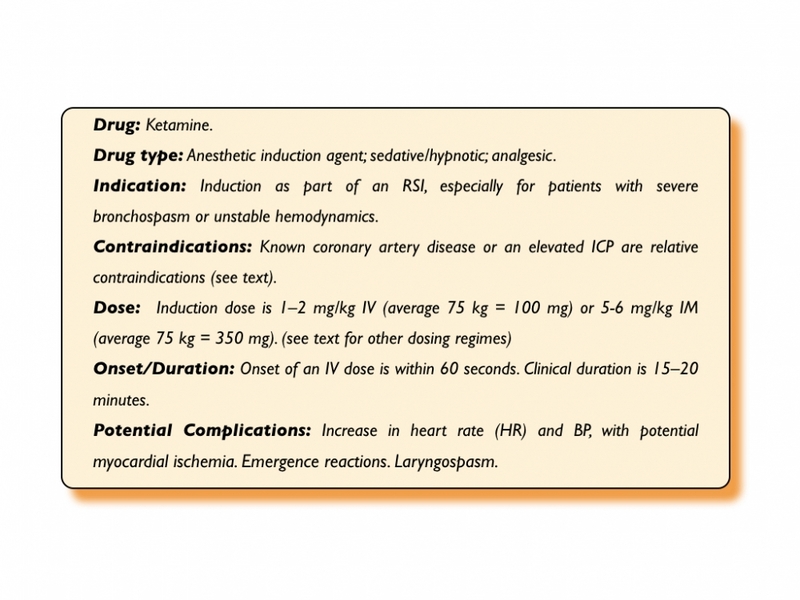 Certainly, in the patient with known or possibly raised ICP who is also at risk of becoming hypotensive (in relative or absolute terms) during RSI, ketamine's hemodynamic effects may help preserve CPP. Ketamine is supplied as either a 10 or 50 mg/mL solution. The induction dose of ketamine is 1-2 mg/kg as an IV bolus however as with other induction agents, smaller doses are often indicated in hemodynamically at risk patients. Onset time is generally within one minute and clinical duration is 15 to 20 minutes. A lower dose should be used for the patient in profound shock. Conversely, the higher end of the dose range should be used if bronchodilation is the goal. The 50 mg/ml format is useful for intramuscular use, for example in an actively uncooperative patient with no vascular access. The intramuscular induction dose is 5-6 mg/kg. An "off-label" combination of ketamine with propofol (each in 10mg/mL concentrations) drawn up in a single syringe ("ketafol") has been used in recent years, primarily for procedural sedation in emergency departments  The mixture, which can be customized (% ketamine:% propofol i.e. 25:75, 50:50, 75:25) is being used by some for induction as part of an RSI regime in an attempt to maintain stable hemodynamics. Analgesia (0.1-0.3 mg/kg): As previously discussed ketamine is a potent analgesic and at relatively low doses can produce consistent pain relief, comparable to opioids and with minimal adverse events. Recreational (0.2-0.5 mg/kg): Ketamine is being used as a 'street drug' that can cause a desirable combination of euphoria and perceptual changes that if anticipated, can be perceived as pleasant. Partially dissociated (0.4-0.8 mg/kg): In this sub-dissociated state patients can have significant perceptual disturbances and may become frightened and uncooperative during the sedation. This is different than the later occurring emergence phenomena that is well described with ketamine as its sedative effects wear off. Treatment for this state is to provide additional dosing to take them to a desired dissociated state. Dissociated (> 0.8 mg/kg): For airway management an induction dose as part of an RSI for ketamine is 1-2 mg/kg and disassociation is usually achieved at doses > 0.8 mg/kg although some patients may achieve this unaware state at lower doses. Ketamine related adverse events are often delayed with the most prominent being unpleasant emergence reactions characterized by "bad dreams," disorientation and perceptual disturbances. The reported occurrence rate of emergence reactions is variable (10-20%) and seems to be related in part to the "state of mind" at the time of the drug's administration. In contrast to a partially dissociated state where giving more ketamine will 'push' them through this adverse response, benzodiazepines have been shown in some studies to be effective in preventing and managing emergence reactions. For children, this phenomenon is not reduced by concomitant administration of benzodiazepines. Emergence reactions are not generally a consideration in the patient requiring RSI in emergencies. Referred to as Delayed Sequence Intubation (DSI), ketamine has been shown to facilitate preoxygenation particularly in combative or uncooperative patients by allowing them to tolerate pre-RSI oxygenation interventions such non-invasive ventilation. Ketamine use has been described as a potential adjunct to (not as a substitute for) meticulous topicalization for an awake intubation (see Awake Intubation Chapter). If subsequent instrumentation for an awake intubation is not tolerated and the patient has been properly topicalized, proceeding with full dissociation may be appropriate in select cases. This decision must be based on a bedside risk/benefit analysis with the alternative being to abort the awake approach and moving to an RSI. Ketamine facilitated intubation (KFI) describes a method where ketamine is used alone to sedate a patient for intubation. This method is being adopted by both hospital and prehospital proponents as a safe and feasible alternative to performing an RSI. The rationale for this approach is to dissociate the patient, producing a sedated state where they are still able to maintain protective airway reflexes while spontaneously breathing, to facilitate intubation. This approach should not be confused with an awake intubation where the patient retains awareness of their surroundings and ideally remains cooperative during the procedure. Ketamine, like other sedatives may not optimize conditions for intubation and may be associated with lower intubation success rates and higher complication rates compared to RSI. Ketamine can increase muscular tone and combined with its potential for causing laryngospasm during upper airway instrumentation, some have questioned its use as a standalone pharmacologic aid to intubation. Currently there is very little published evidence supporting KFI in terms of safety and efficacy. It may be that KFI can fill the void of options that plague emergency airway management for patients in whom a risk vs benefit assessment favors an non-RSI approach and an awake approach isn't feasible. However at present there is no the literature to support this strategy. Hopefully users of this approach will share their KFI experiences in the published literature in the near future.